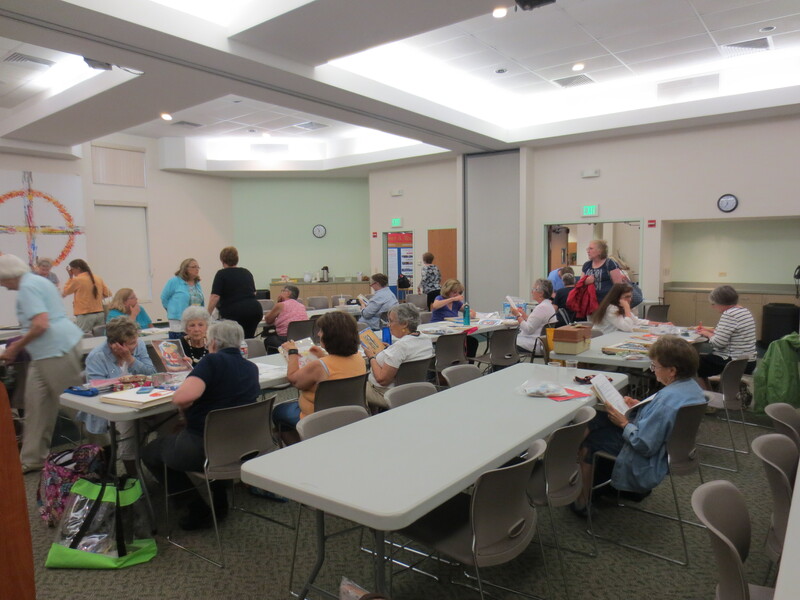 Stitching a needlepoint Santa design in July? Why not? The Colorado Columbine Chapter met in July just before summer break from formal meetings. Needlepoint in progress and in finished form was on the agenda, as always! There were many new faces in the crowd and several new members were acquired that night. The chapter continues to grow at a rapid rate. Class focus was on Libby Sturdy’s Mile High Santa, which some members had started last month and nearly completed. Caela T. shared a new technique of her own devising: How to make a round, pom-pom-shape mound using turkey work! We learned how to use turkey work, stitched in a circular rotation, to make a domed bobble for Santa’s ski cap. Karen R. brought materials to use for practice and supervised the group. Gloria M. shared Libby Sturdy’s charted design for the windy skies seen in the model at right, below. 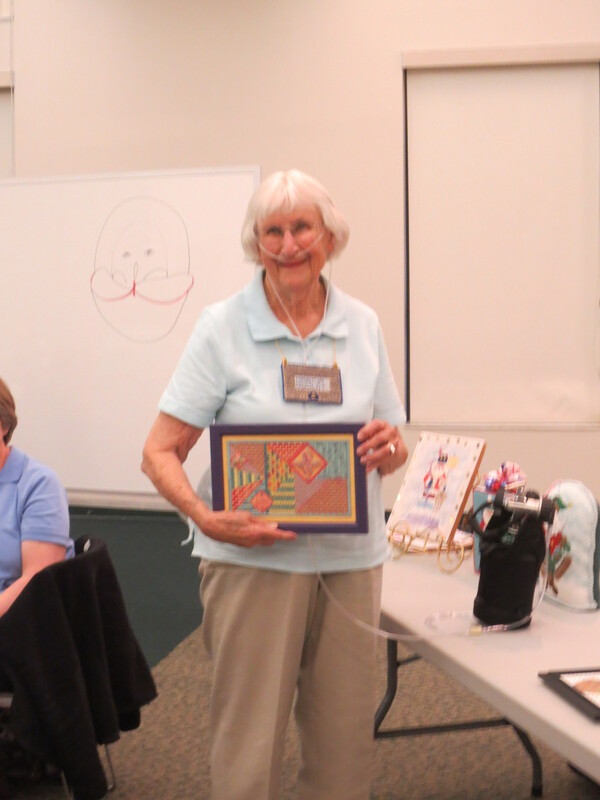 For Show and Tell, a beautiful array of spectacular finished items was shown to the membership. 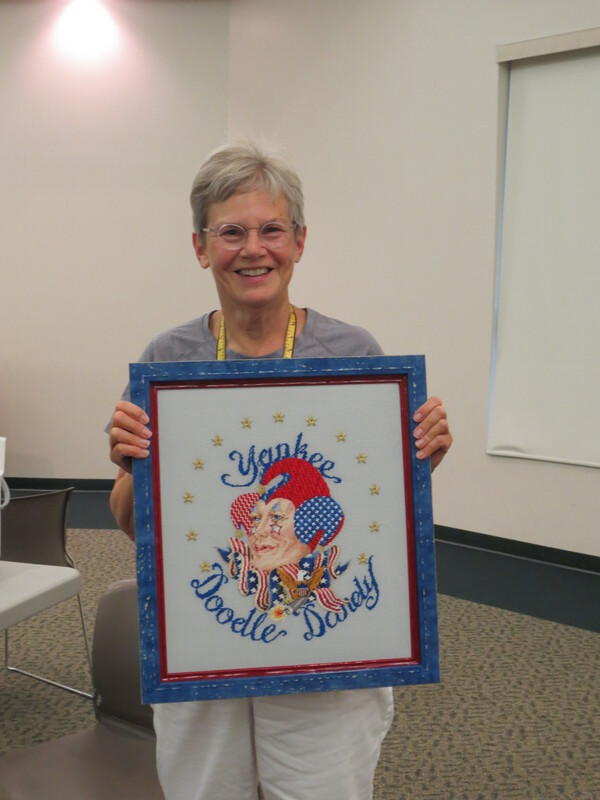 Cynthia’s glorious ‘Yankee Doodle Dandy’ is just breathtaking! What a fabulous stitched piece and finishing! 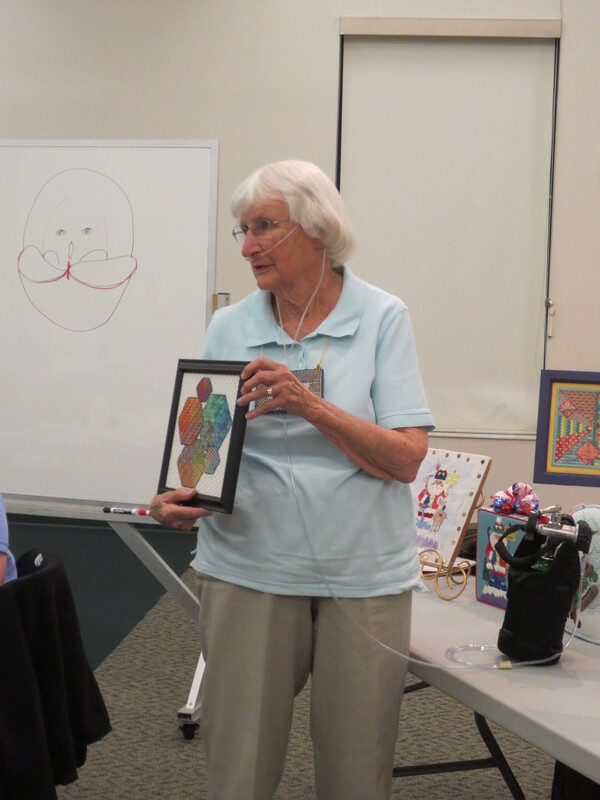 Here, our Marcia G. shows a gorgeous framed needlepoint project which will go on her ‘gallery’ walls at home. 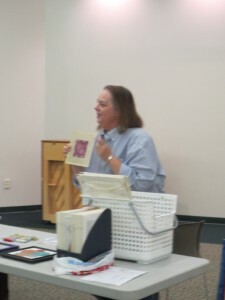 Below, she shows a finished Jennifer Riefenberg design called Color Play that was offered as a pilot class in the spring. A ‘pilot’ class allows students to take a designer’s class and offer feedback on difficulties or thread usage. The class, vetted, then goes on to be offered nationally at other venues. Marsha R. had a finished piece with lovely lavender colors in play. The next meeting is September 21! 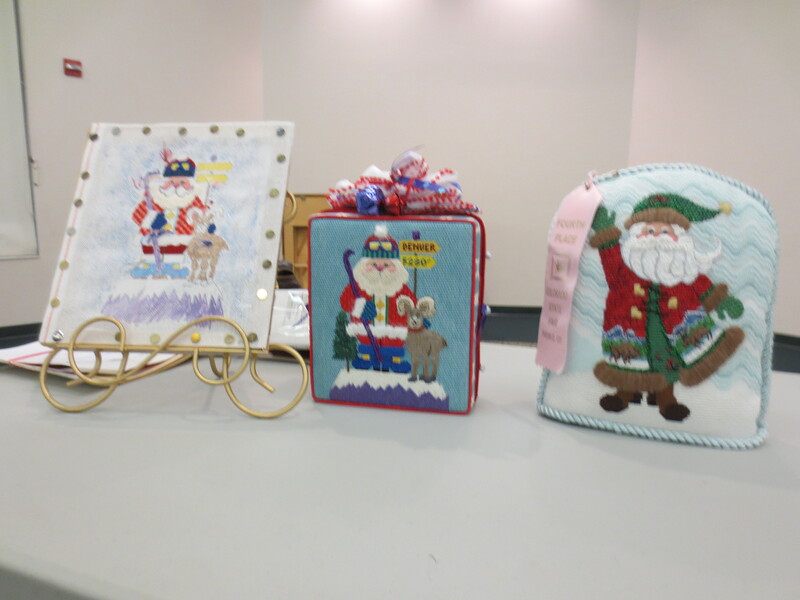 Doors open at 6:30 p.m. We will be stitching the elegant Snow Crystal winter tree, a delightful design, all sparkly and wintery, by Nancy’s Needle, which will be taught by Barb G. Design size is 8.3″ x 8.3″ on a 14″x14″ canvas.